Syria Daily, Sept 9: The Russians Are Coming…. Audio Analysis: Political Stalemate and Military Challenges — What Happens Now? Diplomacy around Russia’s military intervention in Syria heated up on Tuesday, with firmer evidence of the scale of Moscow’s despatch of equipment and troops. Bulgaria blocked Russian flights to Syria, denying Moscow’s request for use of its airspace for military transport plane. Under US pressure to stop the Russians, Greece said on Tuesday that the issue had been resolved by a Russian decision to use a route to the east of Greek airspace. The Greeks did not say if that Russian plan had then been checked by Bulgaria’s denial. An American official said last weekend that the Russians had used an aerial path over Iran and Iraq for two large Condor transport planes carrying supplies and equipment from a base in southern Russia. The material was delivered to Russia’s naval base at Latakia on Syria’s Mediterranean coast. The official also said a Russian troop transport plane landed at the same airfield in Latakia over the weekend after flying over Greece and Bulgaria. There were also further images on Tuesday of Russian military ships moving through Turkey’s Dardanelles Straits to the Mediterranean, apparently carrying vehicles and equipment under camouflage nets. At the same time, a “Syrian military official” offered the first confirmation — if his account is trusted — of Russia’s commitment to more military “advisors” to help regime forces hold back rebel advances, as he told a pro-regime activist of the arrival of 700-800 Russian troops. Most have been deployed to the Syrian Army’s base at Slunfeh in northeastern Latakia Province. Assad forces are trying to use their Latakia positions to check a rebel advance that has taken much of the al-Ghab Plain in neighboring Hama Province. The gains by the rebel Jaish al-Fateh coalition began this spring and were consolidated last month. They threaten Latakia, which is seen as essential to the Assad regime’s survival because of the high number of Alawites, the same group to which the President belongs. More than a week of rumors of the scale of Russia’s intervention have been fed by unnamed US officials who told journalists that Russia was preparing to deploy advisers and military personnel to the airfield south of Latakia city. The preparations included the delivery of prefabricated housing for as many as 1,000 personnel and a portable air traffic control station. An Israeli newspaper went farther, exaggerating the limited evidence of Moscow’s deliveries to make the unfounded claim that Russia was flying warplanes over Syria for the first time, and that Moscow had sent in battlefield troops. Mainstream media, including in the US and Britain, further hyped the assertions. On Tuesday, American officials fed further speculation by telling journalists of “unconfirmed sightings of Russian Spetsnaz special forces at the Syrian Naval Academy”. We are not saying on day one Assad and all his cronies have to go. If there was a process that was agreed, including with the Russians and the Iranians, which took a period of months and there was a transition out during that period of months we could certainly discuss that. Hammond’s comments follow a Wednesday statement by Prime Minister David Cameron which revealed Britain’s first drone strike inside Syria — killing three Islamic State fighters, two of whom were British citizens — but said nothing about the approach towards the Assad regime. We have to be part of the international alliance that says we need an approach in Syria which will mean we have a government that can look after its people. Assad has to go, ISIL [the Islamic State] has to go. Some of that will require not just spending money, not just aid, not just diplomacy but it will on occasion require hard military force. A Druze journalist with contacts in Sweida Province in southeastern Syria says that “all the fingers of accusation” point at the Assad regime over last week’s assassination of a Druze sheikh. Sheikh Walid al-Balous was among at least 35 people killed in a double bombing on Friday. The regime subsequently said a single “terrorist” had been arrested for the explosions. 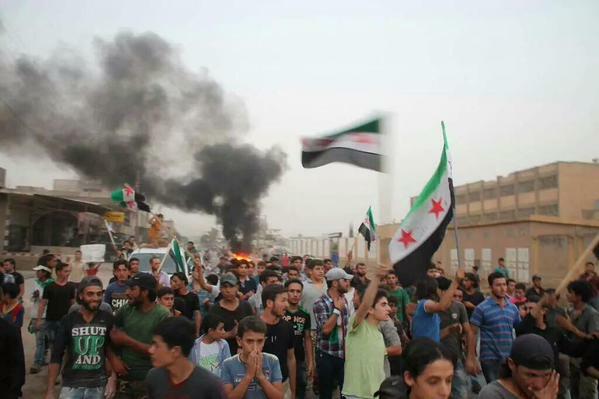 The attacks fed protests which have been building in Sweida over high prices and corruption. Regime opponents had demonstrated for days in a peaceful and civilized manner, observed by the media, which put the regime in a difficult position because it could not accuse them of being terrorist gangs, and so it cut off communications and the internet. Hours before his assassination, Sheikh al-Balous intervened, saying to the regime that the protesters were under his protection, that it was forbidden to approach them, and that they had the freedom to demonstrate. Three hours later, he was assassinated. Because of that, all the fingers of accusation pointed directly to the regime. Abu Khair also says the explosions were in parts of Suweida city “that are difficult for any extremist organization to enter due to the presence of [regime] security checkpoints and Sheikhs of Dignity [al-Balous’s group] checkpoints”. Prevented from entering the hospital where al-Balous was taken, people “forced the regime soldiers from the hospital and began to storm the security branches one after another, just as Sheikh al-Balaus had threatened [to do to] the regime for two years”. Reason is currently prevailing in the province. During events like this, even the loyalists and the opposition find agreement. Our political situations are different, but this does not mean that we will destroy the province. We hope that this agreement will continue. Currently, there are loyalists and opponents organizing traffic and protecting government centers. The activist Patrick Cockburn, who works as a journalist with London’s The Independent, tells a British Parliamentary hearing that the UK and its allies should cooperate with the Assad regime against the Islamic State. That cooperation, he says, should include bombing missions. The Islamist faction Jabhat al-Nusra pulled back from a confrontation with residents of Atareb town in Aleppo Province on Monday, amid a protest over the attempted arrest of a local man, Muhammed Quijo. The demonstration began when a Jabhat al-Nusra fighter and the man traded insults. The dispute led to gunfire, and other Nusra members took up positions in the town as Quijo refused to turn himself in to the town’s independent Sharia Court. “The people of the town gathered en-masse to prevent the arrest of Muhammed Quijo, blocking the main street to prevent Nusra from advancing, in addition to retaking checkpoints Nusra had taken over from other rebel factions,” local activist Muhammad al-Shafaie said. The Nusra fighters left their checkpoints and returned to headquarters. Residents have complained that Nusra, which maintains a contingent of about 35 fighters in Atareb, have imposed taxes and plan to confiscate public land “for the service of Muslims”. Atareb is home to former members of the US-supported rebel faction Haraket al-Hazam, which was disbanded in March after it lost a battle with Nusra. The Jaish al-Fateh rebel coalition and the Islamist faction Jabhat al-Nusra have captured most of the regime’s last airbase in Idlib Province in northwest Syria.